I had a good time catching up with Marriane and Carmen at the Village Den. I expected to see a lot of all old faces from way back high school but sad to say only 2 arrived. But that’s okay as long as they won’t miss the Reunion Day. Yan ang importante! Anyways, we manage to finish the agenda that night the planning of our get-together. We were planning while having chikka about how we are doing now in between. 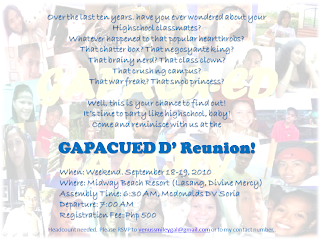 It’s been 8 years past and we are excited to reconnect with former classmates who have been part in the 4 years of studying at Cagayan de Oro National High School. I really wonder how they are all doing since our class is composed of different characteristics, complex and talented people. During my online survey most of them likes beach so we decided Midway Beach Resort is the perfect place since meron din silang pool, group cottages for overnight stay, zipline and more activities to enjoy. A perfect place for bonding talaga! The When. Well, we weigh things over talaga. During the survey most people are available during weekends lang, so majority wins. Then others from far towns are going to file leave of absence just to attend this event so might as well give them much time to spend with us. Assemble time is early because we need to travel from CDO to Initao. So we could spend much time na talaga. To others who will not file leave of absence you can attend on Sunday activities instead. Devine Mercy. Might as well hapit ta diri since malabyan mani in going back CDO.